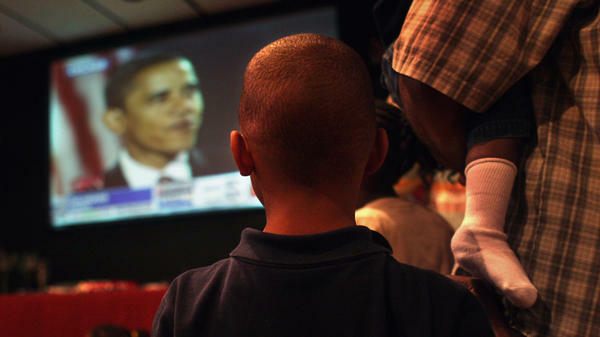 Quentyn Israel, 6, watches with his father and siblings as President-elect Barack Obama gives his victory speech on Nov. 4, 2008, in Denver, Colo.
A man holds a sign as he takes part in a protest against Republican presidential front-runner Donald Trump in New York on March 19. L: Mourners and activists hold a vigil during a rally in El Cajon, Calif. on Sept. 28, in protest of the police shooting the night before. 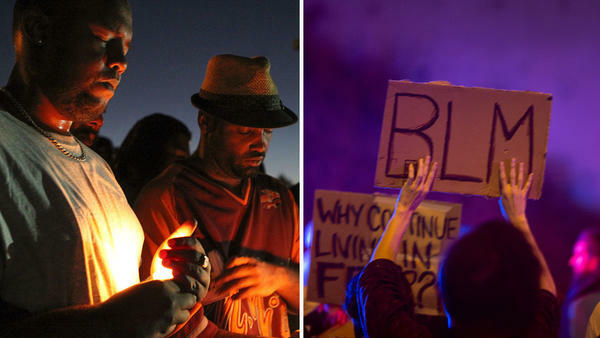 R: A protester holds a Black Lives Matter placard during a march on Sept. 30 in El Cajon, Calif., in reaction to the fatal police shooting of an unarmed black man. President Obama speaks during a campaign event for Hillary Clinton in Greensboro, N.C., on Oct. 11. Kalena Boller remembers exactly where she was during Barack Obama's first presidential inauguration: at work. "I was the only Black person in the entire pre-production room." Boller is an Atlanta-based TV producer and on Jan. 20, 2009, she says her white coworkers treated her extremely well when they all gathered to watch Obama take the oath of office. "When I walked in, it was almost like they rolled out the red carpet for Kalena," she said. "They said, 'come sit.' They let me sit in the front. I have an Afro! So I was blocking people's view. And I started crying, and a tissue box rolled up. I felt like royalty! It was weird, but you know what? I said, 'Let me have this.'" From then to now, it's been emotional-political whiplash. When asked to compare her joy that day to her experience watching the 2016 presidential campaign unfold, Boller said, solemnly, "I often times just want to go home, get under my bed, and just stay there. But I can't." Boller's experience this year is hardly unique. In a series of interviews with black voters in Atlanta late last month, people told NPR that 2016 has been equal parts nostalgia, disgust, and ambivalence. Many say they are faced with a candidate — Donald Trump — they see as racist, and another — Hillary Clinton — many just can't get excited about. On top of that, the last several years have been full of the same storyline, repeated over and over but with new names: unarmed black people being killed by police. Criminal attorney Gerald Griggs called Election 2016 "the circus." Michelle Gipson, an Atlanta-based publisher, called it "mayhem — what I imagine politics to have been like in the 60's." Stacey Abrams, house minority leader for the Georgia General Assembly, said the country's reaction to this campaign reminds her of Stockholm syndrome, with Americans allowing "ourselves to be convinced this election makes sense." The poll numbers rarely tell a story this complex. Consistently, Hillary Clinton has drawn overwhelming support in the black community while Donald Trump has found next to none. (One poll registered Trump at 0% with black voters.) But several voters told NPR they are less than excited about this election and are worried about the state of American politics. Boller and others told NPR they expect black voter turnout to be down from historic highs in 2008 and 2012. The Associated Press reported that in 2008 black voter turnout exceeded white turnout for the first time, and in 2012 African Americans again turned out more than whites. In 2008, young black voters had a higher turnout than other young people, and black women voted in higher proportion than any other demographic group. Should Hillary Clinton be able to recreate the winning coalition Barack Obama relied on previously — buoyed largely by strong support from black voters — there is a chance many of those voters will cast their ballots with much less excitement and fervor than four or eight years ago. And that's in part because 2016, for several reasons, has just been more depressing. 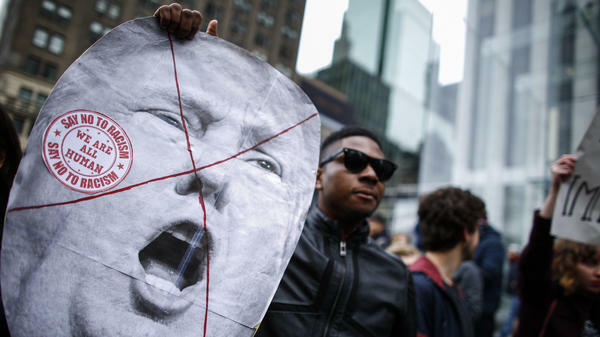 When asked, several voters told NPR what's particularly difficult about 2016 is how much all of the negatives — particularly the tenor of the discourse — seem to be tied to race. "I think it all comes down to race," said Michelle Gipson. "It used to be economics, it used to be the disparity between the haves and the have-nots. 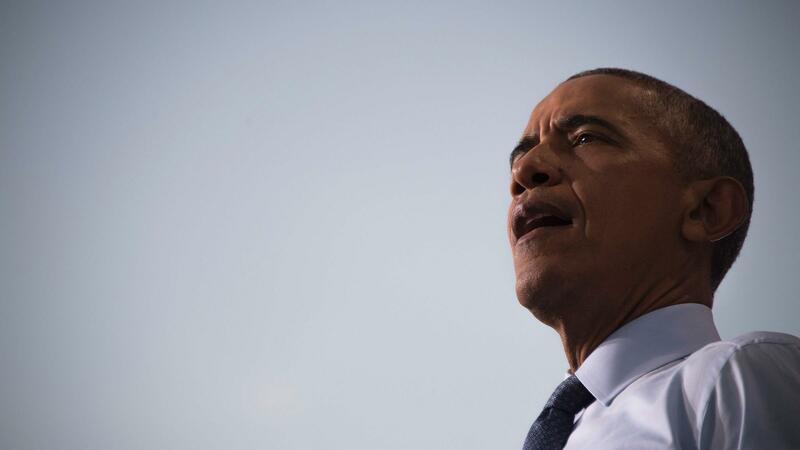 Now I think much of the values [at the forefront of the 2016 campaign] centers around race." Others put it more bluntly. Richard Rose, president of the Atlanta chapter of the NAACP, said this year is just the latest chapter in America's tortured racial history. "America has never repudiated white supremacy," Rose told NPR. "America has normalized white supremacy and racial oppression." Minny Shannon, 73, told NPR that views one might not have expressed a few years ago are now on full display this campaign season. "It's out in the open because we had the nerve to vote a black man in," Shannon said. "And they are doing all of this because they really can not stand — lots of them, lots of white men, especially Southern white men — can not stand the idea that they have a black man in the White House with his black family." This may be 2016 for a large portion black America: a feeling that who they are, and what America's first black president symbolizes, are under attack. This year's presidential campaign seems to have taken an even harder toll on younger black voters. For many, their first experience in presidential politics has been watching one of the nastiest, most contentious elections in modern history. Some of them may still be smarting after the primaries, too. Young black voters chose Bernie Sanders in high numbers during the Democratic primaries, with Sanders winning the black youth vote in several states. Brianna Butler was only 10 years old when Obama was first inaugurated. She's 18 now, and this will be the first presidential election in which she can vote. "The whole election just makes me feel like I want to go back in time, to where I was 10, and not have to worry about this. All I had to do was go to school," Butler said. "This is the real world?," she asked, rhetorically. "This is what I've been waiting on? This is what I get?" Voters expressed little hope that America's racial climate will get better anytime soon, no matter who wins the election. Vennise Lundy, an Atlanta-based accountant, says that's because no one person can do it all. "One person can not come and solve the racial issues, the economic issues that are going on in this country," she told NPR. "We are expecting them to be God, and not be human. It takes people, groups of people, and also it takes decades and generations." As far as getting that work done? Kalena Boller, who felt like royalty on Obama's first inauguration, promised to remain resolute, through the rest of this campaign season and beyond. "The climate is scary," she said, "but I'm not scared."